Our June Show this past Sunday was an outstanding display of excellence and creativity. We were so impressed by the diversity of booth layouts and the integration of new technologies and marketing strategies. From video displays to social media interactions to product merchandising, it was nearly impossible coming up with the Best Booth Design Winners! Just one more won’t hurt, right? 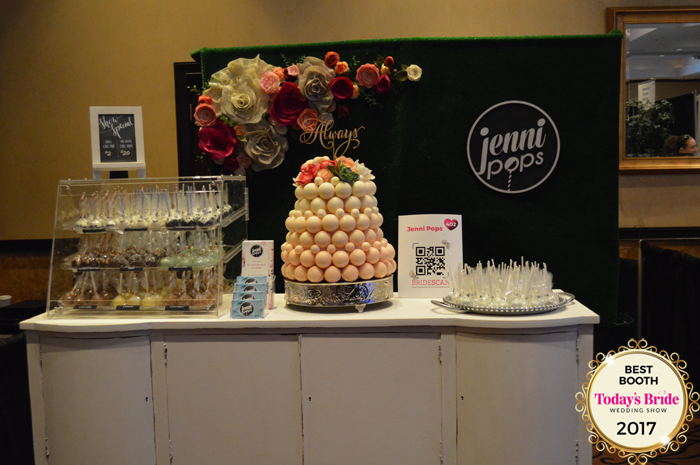 That’s what every bride was asking themselves when they walked past Jenni Pop’s booth this Sunday. With her variety of flavors, eye-catching backdrop, vintage dresser table, and prominent show special, brides found their feet walking toward the booth even as their subconscious urged them to “stay strong!” Her elegant display for an alternative wedding cake design was featured front and center and allowed brides to envision it at their own reception. Her first impression, though, wasn’t her last. By making business cards and pamphlets available and showcasing her BrideScan code centrally, she ensured brides would remember her booth long after the show. Well done! It’s all about the likes, and J Sullivan Travel proved that they know their audience when they brought along this mock-Instagram cut-out. Millennials love selfies and are all about posting to social media. J Sullivan took advantage of this massive marketing platform by ensuring that every bride (and all of her followers) would like, tag, and follow her Instagram. This not only increased her following but provided her with a phenomenal way to collect leads and keep in contact with interested brides! Smart move! We were stunned and impressed when we saw Lip Sense’s booth display at the June Show! What an impression! With visual displays, product merchandising, an inviting space to browse, and on-trend decor, Lip Sense went above-and-beyond our first-time exhibitor expectations! Brides instantly knew what they were selling and were able to sample the product there and then! They had an informative video, visible pricing, and lots of signage – always a must for the millennial bride. Bravo on your entire booth space design! want a booth in the next bridal show? We can help!